Do you know any identical twins? Most people are amazed with how much they are alike, not only in the way that they look but also in the way they think and act as well. Of course, each person is an individual and there are going to be some differences but the crossover is surprising. When you see these twins, you will know that they are also simpatico in their behavior and their abilities. In fact, it is amazing to see it in action. These sisters are identical twins named Ashley and Angelina Leyva. More than likely, you have never heard of them before but after watching this video, you are sure to know more than their names, you are going to know their talents as well. 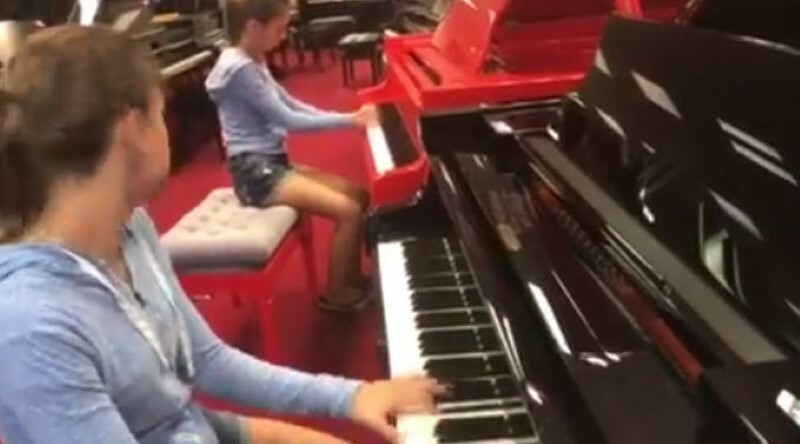 It happened when they walked into a piano store, which isn’t anything unusual on it’s own but once they sat down and started playing the piano, there was nothing stopping them! Fortunately, there were cameras following them and they were able to record the entire scene for the world to see. There is no doubt that these two girls are on their way and we hope to see more of them soon. 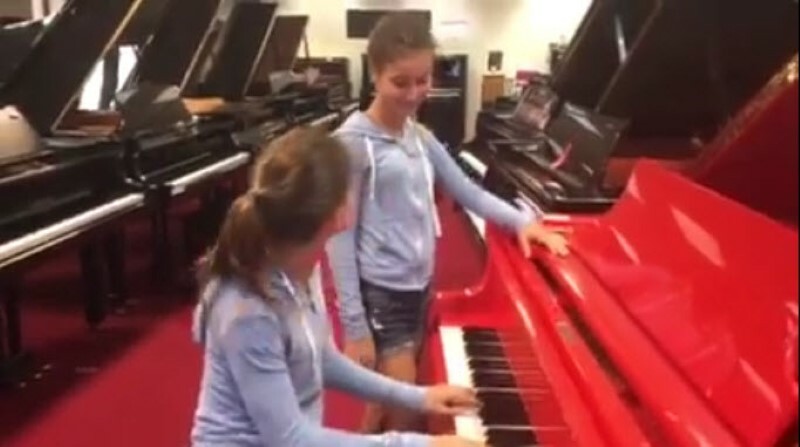 As the twins walk through the piano store, they suddenly stop at a glossy red piano located in the middle. 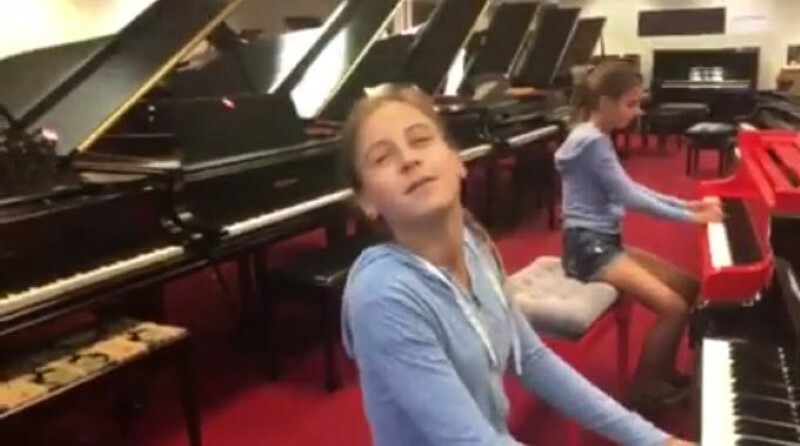 One of the twins sits down and starts to tickle the ivories while the other twin stands and watches. For a moment, you start to think that the second twin is a little bored by what she is seeing but that is when things start to get interesting. The twin who was standing nearby suddenly takes a seat and actually pushes her sister out of the way. Fortunately, there is a second piano nearby and before you know it, they are playing a song together in the most amazing way possible. If you play an instrument, you realize just how amazing of an experience it can be. Music is something that touches us on a very personal level and that is true, regardless of whether you are playing or listening. You can actually see the one girl getting carried away as she is playing and she closes her eyes and enjoys what she is doing. The music they were playing is classified as a boogie woogie. This was a very popular type of music in the past century but it still is fantastic to hear when it is played masterfully. In fact, you can’t help but tap your toes when you hear it and you might even want to get up and dance. Most people think about identical twins as being mirror images of each other but that is not always the case. In some cases, the egg splits before they are fertilized and they are known as “half identical twins.” There are also mirror image twins, who are identical twins who grow asymmetrically. Something else that you might know know about identical twins is the fact that they are not truly identical. They might come from the same egg but identical twins do not have the same fingerprints as each other. One thing that most of us realize about identical twins, however, is that they seem to be in tune with each other in amazing ways. Many twins will talk about how they will call each other with the same thought or perhaps even the same malady, even though they are living far apart from each other. There are many mysteries associated with identical twins but one thing is known, they are amazing. 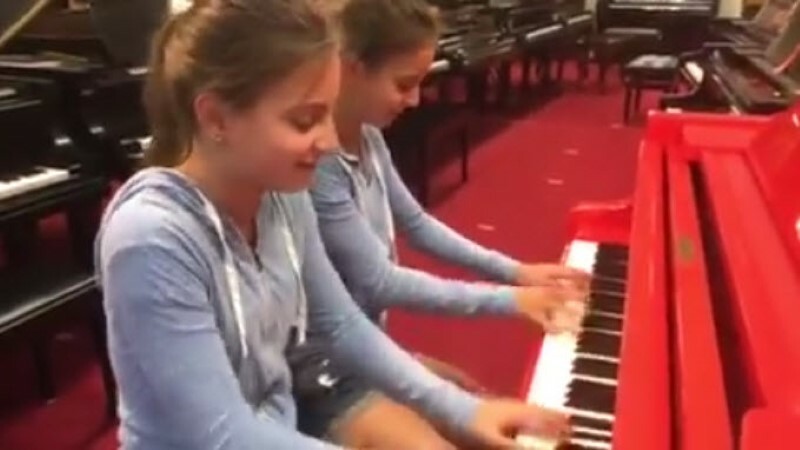 That fact is easy to see when you view this video of identical twins playing the piano. Not only are then talented, they are having loads of fun. Did you love this? Be sure to share it.